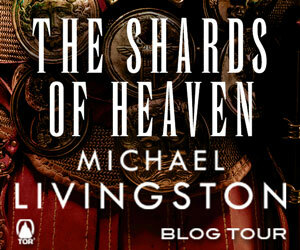 Please welcome Michael Livingston to The Qwillery as part of the 2015 Debut Author Challenge Interviews and The Shards of Heaven Blog Tour. The Shards of Heaven will be published on November 24th by Tor Books. Michael: Hi there! Thanks for having me. I started writing stories as a kid, and the encouragement of my teachers really helped me to aspire to the craft. In fact, I started down the path to becoming a professor in part because I thought it would leave me with blissfully free summers in which I could write novels. Little did I know that I would need to be writing academic books, too! 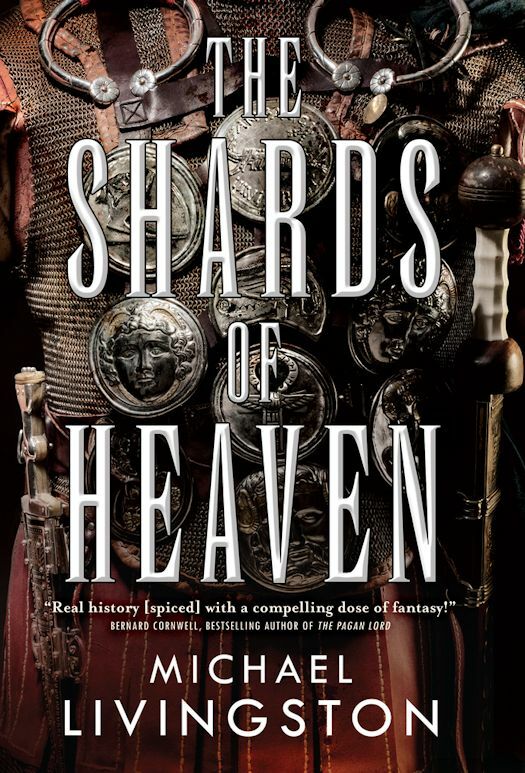 Michael: The Shards of Heaven features a rather intricate series of plots and point of view characters, and it's situated amid the real events of history -- all of which means that at some level I need to be a plotter. The history has to work. At the same time, my outline is actually nothing more than a simple spreadsheet that describes the events of each chapter in one or two sentences. So I afford myself as much room as possible within that script to let my characters take over. I guess that makes me a hybrid. 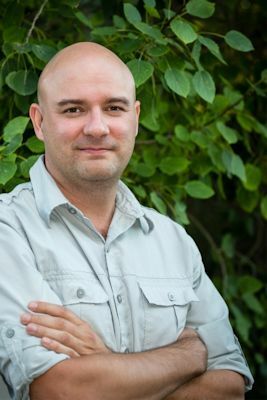 Michael: As a professor I have a fairly busy life of teaching, grading, and doing research and writing on the academic side of my life. So finding the time to get into the mindset of my fiction is by far the most difficult thing for me. I've had to learn to keep the Muse on speed-dial, ready and waiting for any chance I get to steal an hour of time here or there to write. Michael: My tastes in literature are really quite diverse, from medieval writers like Chaucer to modern writers like Brandon Sanderson. On my shelf you'll find J.R.R. Tolkien next to Tennyson, Dan Simmons next to Shakespeare, and Parke Godwin next to Gilgamesh. I try to learn something from every author I've read. TQ: Describe The Shards of Heaven in 140 characters or less. Michael: It is history and fantasy colliding at the rise of the Roman Empire as Caesar's children fight to control the artifacts of gods old and new. TQ: Tell us something about The Shards of Heaven that is not found in the book description. Michael: At its core, this novel is about fashioning a reality from the fog of mythology. I have long been fascinated by the similarities between various legends of the ancient world, and so I tried to find a hidden thread that would bind them all together into a historical adventure that's part Indiana Jones and part Game of Thrones. As an added bonus, if you liked Pullo and Vorenus from the HBO series 'Rome', I'm pleased to say that they ride again in this book. TQ: What inspired you to write The Shards of Heaven? What appeals to you about writing Historical Fantasy? Michael: The Shards of Heaven is actually the backstory for another Historical Fantasy I started writing years ago. It grew so intricate and interesting that I realized it simply needed to be told on its own merit. As for my interest in Historical Fantasy, it really stems from my interest in both worlds: I was trained as a historian, but I've always loved the fantastic. Like J.R.R. Tolkien, another professor of medieval literature who wrote his fantasies in his spare time, I have simply grown fascinated with the holes in our knowledge about the past, and the exciting tapestries we can weave through them. TQ: What sort of research did you do for The Shards of Heaven? Michael: Given the strong historical element, I write with stacks of research at hand: whether that constitutes the tactics of a battle, the archaeological remains of a temple, or the technological workings of ancient armor, I need to know everything I can about my topic. My hope is that this knowledge base doesn't overwhelm the story but instead quietly percolates under its surface, making it all the more real. Plus, I think it will lead to some surprises when those who know the history come across the various Easter eggs I've slipped into the narrative. Michael: The easiest point-of-view character for me was Didymus, the chief librarian of the Great Library in Alexandria. He's a polymath, and while I wouldn't call myself that I do recognize the thirst he has for knowledge. He needs to know, and that need runs so deep it can be all-consuming. For better or worse, I never had any problem facing the question of what someone like that would do or say. Far more difficult for me at the beginning was the daughter of Cleopatra and Mark Antony, Cleopatra Selene. She's a headstrong little girl in the novel -- something I have no experience being! -- but historically she grows up to become one of the most remarkable rulers of her age. It was hard to get that balance right at first, but as I'm writing her in the sequels I'm finding she's one of my favorite characters to engage. I hope readers will adore her as much as I do. TQ: Please tell us a bit about the historical Juba II on which your character is based. Michael: Juba II, like Cleopatra Selene, is an amazing historical figure who should be far better known. His father, the king of Numidia, fought against Julius Caesar and ultimately chose suicide over being paraded through Rome in Caesar's Triumph. Young Juba was taken into Caesar's household as an adopted son -- an act intended to demonstrate his mercy. Add into this potent background his ethnic separation from the Romans surrounding him and the passionate intellectualism that ruled his life, and you could hardly ask for a more fascinating figure to build a story around. For more about what he does, and the power he learns to wield, read the book! TQ: Which question about The Shards of Heaven do you wish someone would ask? Ask it and answer it! Q: In your book, several of your characters decide that God is dead. Do you anticipate any hate mail from that? A: I don't think that's a terribly shocking thing for my characters to conclude, but if it does bother anyone, I hope they don't write me about it. I hope instead they purchase boxes and boxes of my books and burn them. On live TV. You simply can't buy that kind of publicity. TQ: Give us one or two of your favorite non-spoilery lines from The Shards of Heaven. Like a sudden exhalation, matched with an echoing boom that reverberated in Vorenus' chest, the rain came back against them, stinging like a thousand tiny arrows. And behind the rain came the roar of an angry god. Michael: I'm polishing off The Temples of the Ark right now, which is the sequel to The Shards of Heaven. It is scheduled for release in November of 2016. The adventure of the Shards, I'm happy to say, is just getting started! Michael: Thank you for having me. Happy reading, everyone!